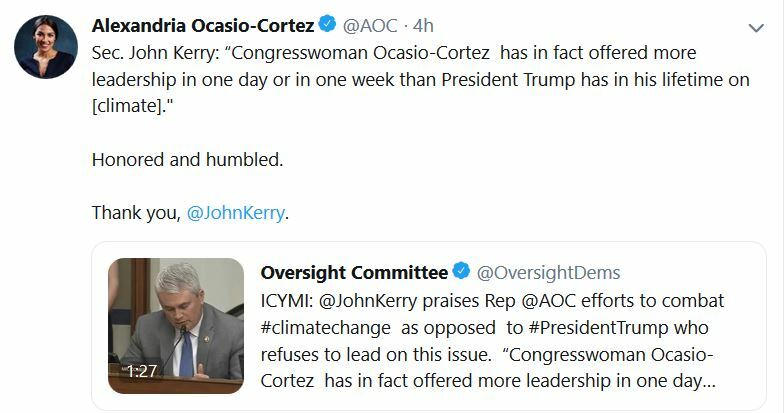 (CNSNews.com) - Former Secretary of State John Kerry told the House Oversight and Reform Committee in a hearing today that Rep. Alexandria Ocasio-Cortez “has offered more leadership in one day or one week than President Trump has in his lifetime” on the issue of climate change. Kerry was responding to a question from Rep. James Comer (R.-Ky.) about the methods that have been suggested for paying for Ocasio-Cortez’s proposed Green New Deal. Kerry countered by asking the congressman “where is your proposal” for dealing with climate change.